If you thought that the town of Bari, Italy had no Thrash Metal scene (and I know that you were thinking it), then you'd be mistaken. Taking their style from traditional 80's Bay Area Thrash Metal, the Italian metallers in BURNING NITRUM put the town on the map. Mixing the vocal style of GAMA BOMB with the fast-paced instrumentation that blends the sounds of EXODUS, METALLICA, and many more to create the classic style that defined an era of Metal. With songs featuring parts reminiscent of the melodic leads in "Master of Puppets" and the pulverizing riffs in "Shovel Headed Kill Machine", there is a great variety demonstrated from these accomplished musicians. Throughout the album, I was compelled to leave my seat and jump in the mosh pit. I'm pleased with the production as well, since each of the songs fits in to the general direction without one sounding less meticulously constructed than any others. The guys in BURNING NITRUM bring a killer sound to the table. 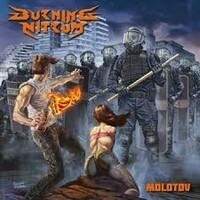 Fans of Thrash and Heavy Metal alike will enjoy "Molotov"!